This guide is designed to provide an invaluable source of money-saving advice for anyone who advises or runs a family or owner-managed company. It examines a wide variety of tax planning matters from the viewpoint of the company, its working and non-working shareholders and its employees. 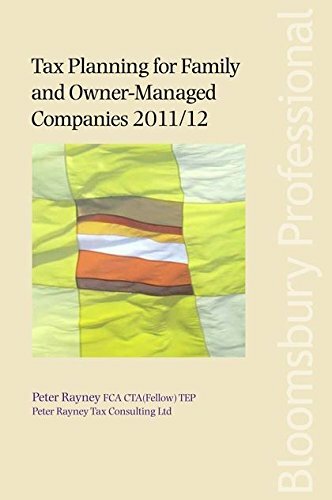 This fully updated new edition contains effective strategies for dealing with particular problems and opportunities for family and owner-managed companies, including: Extracting funds; Remuneration strategies; Benefits and expenses; Succession planning and passing on the company; Selling and winding up the company; Reorganising shares and trading activities (including share buybacks); Dividend strategies; Employee share schemes and pension scheme strategies. The 2011/12 edition of this essential book contains the very latest tax planning strategies and demonstrates how to keep tax liabilities to a minimum. It is fully updated to the latest Finance Act. Worked examples illustrate complex points throughout, and each chapter concludes with useful checklists of planning points referring to the tax position of different parties. Peter Rayney FCA, CTA (Fellow), TEP now practises as an independent tax consultant. He was previously a tax partner with BDO for over twenty years and during the last four years was BDO s National Tax Technical Partner. He specialises in Corporate Tax / OMB Tax and Corporate Finance Tax and is Chairman of the ICAEW Tax Faculty s SME Business Tax Committee.